This racing game boasts 24 cars and 4 different modes of play, with varying difficulty levels. Modes include Time Trial and Circuit Course racing (suitable for beginners and intermediate players), and uphill and downhill versions of Winding road (suitable for Expert players). It is also possible to upgrade engine power and suspension. Racing Jam was originally intended as a showcase title for Konami's new COBRA hardware. After rumors of a hardware switch to the lower-end Konami Hornet hardware, Racing Jam was eventually released on Konami NWK-TR hardware. This racing game boasts 24 cars and 4 different modes of play, with varying difficulty levels. Modes include Time Trial and Circuit Course racing (suitable for beginners and intermediate players), and uphill and downhill versions of Winding road (suitable for Expert players). It is also possible to upgrade engine power and suspension. 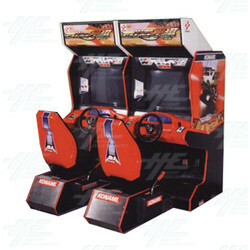 Racing Jam was originally intended as a showcase title for Konami's new COBRA hardware. After rumors of a hardware switch to the lower-end Konami Hornet hardware, Racing Jam was eventually released on Konami NWK-TR hardware.